A hard-throwing, fast-living left-hander, Rube Benton pitched professionally for 24 years, compiling a 150-144 record and 3.09 ERA in his 15 seasons in the National League. Benton had a reputation for drinking, gambling, and driving too fast, all three of which combined in various ways to interrupt his major-league career. He eventually died at age 47 from injuries suffered in a car crash. One of J.J. Benton's six children, John Cleve Benton was born on June 27, 1890, in Clinton, North Carolina. A tall, lanky youth with natural athletic ability, John pitched in several independent leagues, including a 1909 stint with Lakeland in the then-semipro Florida State League. The following year he started the season 11-5 for Macon in the Sally League when the Cincinnati Reds purchased his contract for $3,500, an unusually high price for a Class D player. "Rube" (an inevitable nickname in those days for a country boy from the South, especially one who bore so many similarities to Rube Waddell) made his major-league debut on June 28, 1910, losing to Three-Finger Brown of the Cubs one day after his 20th birthday. He appeared in 11 more games, 10 of them in relief, finishing the season with only the one loss and a 4.74 ERA. Optioned to Chattanooga in 1911, Benton went 18-13 in the minors and returned to Cincinnati late in the season. Though his record for the Reds was only 3-3, he showed promise by finishing five of his six starts and posting a 2.01 ERA. Benton's breakout season came in 1912, when he won 18 games and led the National League with 50 appearances and 39 games started. He even pulled off a steal of home, inspiring W. A. Phelon to pen a poem in his honor. Rube got off to another strong start in 1913, having won 11 of 18 decisions when the motorcycle he was riding early one morning struck a trolley car at high speed. Unconscious when he was taken to the hospital, Benton suffered a broken jaw and numerous cuts and bruises. The Reds suspended him for the remainder of the season. Already, Rube was exhibiting the type of erratic behavior that would plague him for the rest of his life. His contract for 1914 included a clause stipulating that he would receive a bonus if he abstained from alcohol and tobacco to an extent that would satisfy manager Buck Herzog. For that one brief season Benton managed to avoid controversy, winning 16 games (including four shutouts) for a last-place club that won a total of only 60. In 1915 Rube returned to his drinking and carousing, and his record stood at 6-13 when Cincinnati placed him on waivers in early August. The New York Giants verbally claimed him for the $3,000 waiver price, but shortly thereafter the Pittsburgh Pirates offered $4,000. The Reds accepted the Pirates' offer, prompting the Giants to file a grievance. Benton, meanwhile, reported to the Pirates and pitched on August 17 against the Chicago Cubs, who played the game under protest. He tossed a six-hitter and defeated the Cubs, 3-2. One week later, the NL's Board of Directors awarded Benton to the Giants. It ruled, however, that the Pirates had acted in good faith; rather than forfeiting the August 17 game to the Cubs, the Board ordered that it be stricken from the record books and replayed in September. The day after the decision, Rube pitched his first game for the Giants-against the Pirates, of all teams!-and gave up 12 hits in four innings of a 9-7 loss. 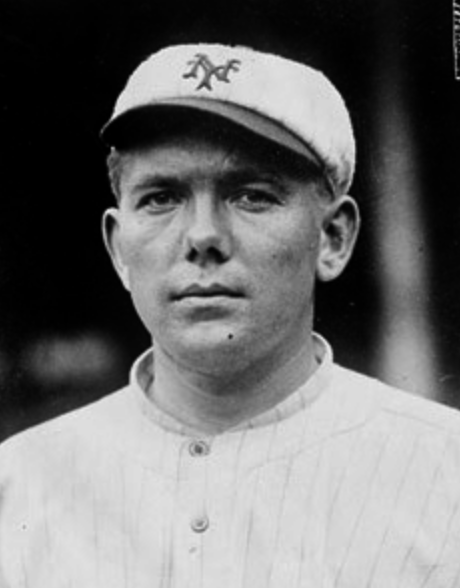 He finished the season 3-5 for the last-place Giants, giving him a combined record of 9-18 for 1915. Despite his concern over his new pitcher's "inability to take the game seriously" (a common euphemism for a player who was an alcoholic), John McGraw thought highly of Benton's pitching ability. The 6'1" left-hander rewarded his manager's faith by winning 31 games and losing only 17 over the next two seasons. In the 1917 World Series Rube pitched Game Three, with the Giants already down two games to the Chicago White Sox, and revived his team with a brilliant 2-0 victory, becoming the first southpaw to hurl a shutout in a World Series. Benton's next start was Game Six, when Heinie Zimmerman was unfairly labeled a goat for chasing Eddie Collins across the plate. Rube lasted only five innings and ended up the losing pitcher despite not giving up any earned runs. Benton's next season was cut short by the military draft. He reported to Camp Jackson, South Carolina, on May 26, 1918, and spent an uneventful year in the army, mostly playing baseball games against college and professional players. Returning to the majors in 1919, Rube won 17 games for the second-place Giants while his old team, the Cincinnati Reds, won the pennant and beat the Chicago team that became known as the Black Sox. Once again Benton became the center of controversy, testifying on September 24, 1920, before a Chicago grand jury that was investigating baseball gambling. At the time he was suffering through a 9-16 season, the worst of his Giant career. Rube testified that the only game-fixing incident he knew of was an offer from Giant teammate Buck Herzog and Cincinnati's Hal Chase to throw a game against the Cubs in September 1917, but he had refused their bribe and won the contest. Herzog, though, didn't appreciate Benton's bringing up his name before the grand jury. Claiming that Rube had carried a grudge against him since 1915, when he was managing the Reds, Herzog counter-charged that Rube won $3,800 betting on Cincinnati in the 1919 World Series. He produced affidavits signed by Tony Boeckel (who, like Benton, later died in a car accident) and Art Wilson of the Boston Braves in support of his claim. The grand jury subpoenaed Benton a second time, and this time he admitted knowing that the 1919 World Series was fixed. Though he denied betting on the Series himself, Rube testified that Chase won $40,000 on the Reds, and he also named four of the Chicago players who were in on the fix. Benton's testimony was a vital link in a chain of events that led several of the Black Sox to admit their guilt. Rube pitched well at the beginning of the 1921 season, compiling a 5-2 record and 2.88 ERA, but the Giants suddenly released him in midseason. There was no official explanation for his release or the failure of any other big-league club to claim him, but Benton was now considered an undesirable character. The Giants assigned him to St. Paul of the American Association, and in 1922 he won a total of 24 games, including the only two games the Saints took from the International League-champion Baltimore Orioles in the Junior World Series. Both the St. Louis Browns and the Cincinnati Reds expressed interest in Benton for 1923. 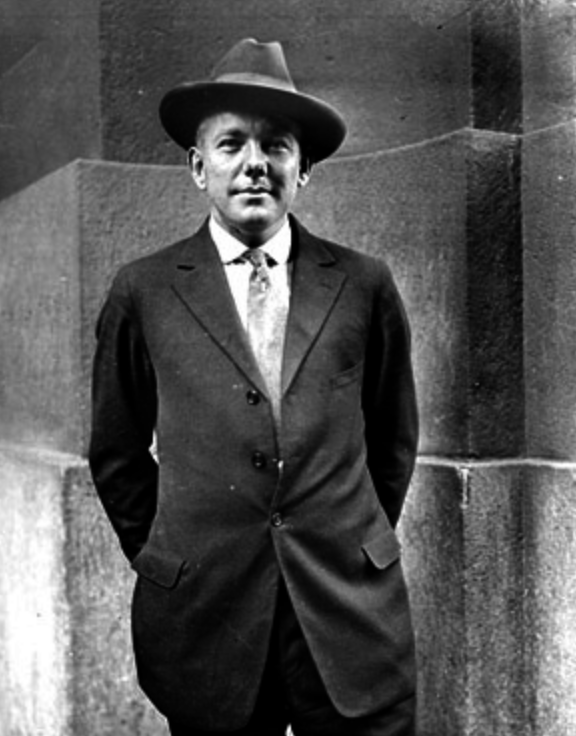 American League president Ban Johnson declared Benton ineligible, however, and National League president John Heydler followed Johnson's lead, though he decided to leave the final decision to Commissioner Landis. To everyone's surprise, Landis ruled on March 8, 1923, that "Benton is eligible to play with the Cincinnati club and no one is going to keep him from doing so if that club wants him." This seemed to be a direct contradiction to his decisions in the cases of Buck Weaver and Joe Gedeon, both of whom were banned for life for having "guilty knowledge" of the fix, but Benton spent three more seasons with the Reds, winning 30 games and losing 29. His 2.77 ERA in 1924 was fourth best in the league. After the 1925 season Benton drew his release from the Reds and returned to the American Association, pitching the next eight years for the Minneapolis Millers, a team often referred to as "the Old Men's Home of Baseball." In 1931 Rube was returning from a hunting trip in Indiana when he swerved to avoid a hay wagon and crashed into a statue in front of a cemetery. He suffered a shattered cheekbone, an injury to his hands, and internal injuries as well. Newspaper coverage of the accident noted that his family investigated and reported that he hadn't had a drink all day. It was feared that Benton's pitching career was over, but he recovered in time to post an 18-7 record for the first-place Millers in 1932. He continued to pitch for Minneapolis through 1934, finally hanging up his spikes at age 44. Benton came out of retirement to pitch in a semipro game for Erwin, North Carolina, on June 27, 1937, claiming it was his 50th birthday (though record books showed he was only 47). On December 12 of that year he was involved in a head-on collision in Dothan, Alabama, and died of a fractured skull and chest injuries. His wife and one daughter survived him. An earlier version of this biography appeared in SABR's "Deadball Stars of the National League" (Brassey's Inc., 2004), edited by Tom Simon. Dothan (Alabama) Eagle. 12/12/1937 obituary. Lane, Frank. "The Sensational Rube Benton Affair." Baseball Magazine, May 1923. National Baseball Hall of Fame. [Gary] Herrmann Letter File, and Rube Benton file. National Baseball Hall of Fame. T.F. Sawyer letter to Frank Lane. New York Times. 12/13/1937 obituary.